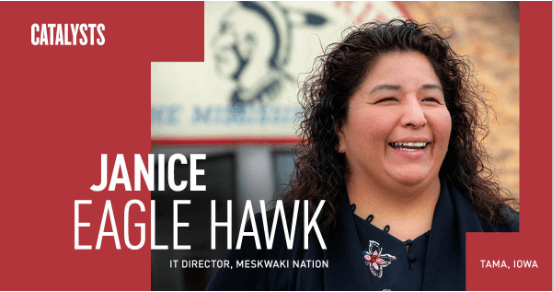 Meskwaki Nation IT Director Janice Eagle Hawk was recently featured by the Technology Association of Iowa (TAI) as part of their 2019 Catalyst spotlight program. The series, sponsored by Corteva Agriscience and DuPont Pioneer, was launched by TAI in 2018 and seeks to “profile amazing women tech leaders from across the state who offer diverse perspectives and are guiding meaningful change within Iowa’s tech landscape”. Last year, ten Iowa women in the technology industry were interviewed and featured as Catalysts throughout the year. Catalysts are technology leaders who inspire change, forge new paths and ignite technology innovation in the state of Iowa. The series is a collection of conversations providing a glimpse into the lives of the subjects and focuses on their career path and perspectives on the future of technology.